The OME-PCI-TMC12 is a PCI-Bus general purpose counter/ timer and digital I/O board. It provides twelve 16-bit counter/ timer channels. Two internal clock sources (8M /1.6M and 0.8M / 80K) are selected by jumper. Four 8254 chips provide a variety of powerful counter/timer function modes to match your industrial and laboratory applications. All boards are supplied with a standard software development kit for Windows XP/Vista/7. The software development kit includes dll files for programming in C, C++ or other high level languages and OCX files for Visual Basic or Active X programming. LabView drivers are also included. 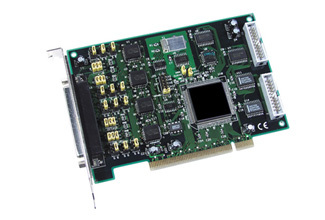 Each OME-PCI-TMC12 data acquisition board includes complete operator ’s manual and software development kit on CD ROM.